These puffy Apple Soufflé Pancakes will charm anyone — kids, guests, your in-laws, even yourself! I love making these and my kids are always happy when I do. Try them — they’re easier than you think and everyone will be happy! I’ve liked this puffy pancake since my grandmother made one pretty similar to mine,. satisfying my appreciation for eggs and fruit together.And because I usually always have eggs and apples around, this easy-to-make dish is a familiar one at our dinner table—and shows up for other meals, as well. Whisk the eggs with the milk and 1 tablespoon of the sugar. Whisk in the flour and salt until smooth. 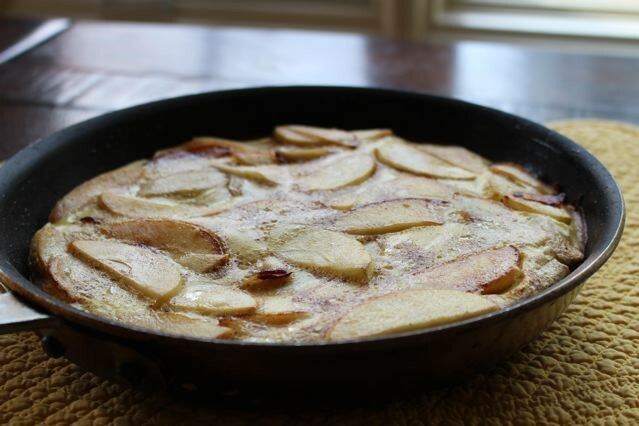 Melt the butter in an oven-safe skillet over medium heat and when it begins to bubble, add the apples and cook for 4 to 5 minutes, tossing very gently. Sprinkle the remaining tablespoon of sugar and the cinnamon, if using, over the apples and cook for 2 to 3 minutes longer or until tender. Pour the batter into the skillet and transfer it to the oven. Bake for 10 to12 minutes or until the mixture sets and puffs slightly. Serve hot from the oven, sprinkled with more cinnamon, if desired, and with maple syrup.